This was the last book I am going to read for this year’s YALSA Best of the Best Reading Challenge. And I tell you what, it has been one long journey of reading (and listening to) so many great books. And I am glad I waited to add this last audio review (seeing how I put this one on hold at the very beginning and I just got it recently). 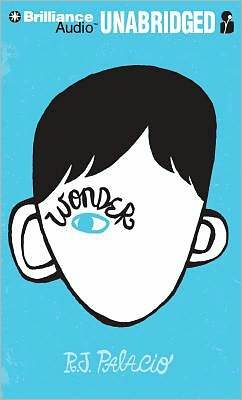 This book is about Auggie Pullman, a boy who is about to start the 5th grade at Beecher Prep. The only trouble is that Auggie has never been to public or private school before. He was home schooled. Because it was too dangerous for his health to be exposed to a school full of germs. And seeing how he was in and out of the hospital for surgery so often due to the extreme facial deformities that he has, he is unsure about exposing his face (and himself) to a middle school full of peer pressure to be “normal” when he knows he never can be. One of the things that I liked the most about this book was the audio recording itself. There were multiple readers, which was great seeing how you really got a sense of which characters were speaking. And the brilliant thing about the book is that it isn’t just in Auggie’s point of view. There are tidbites that you learn from his sister, his friends, and even a friend of his sister. And those parts aren’t just about Auggie. They are, but that isn’t all they are about. For example, here I was listening to this audio book thinking “that sister is pretty mean sometimes” and then comes the part of the sister. Yeah you find out why she was mean (which is the part that relates to Auggie), but you get loads more details as well. Similar to how in life everything that happens with the sister isn’t totally focused on her brother. Readers get a hint about what is happening outside of Auggie’s world even though it will eventually affect Auggie. And to top it off, Auggie is just such a great character. He is the type that you would wish you could be friends with in junior high school. He can see what happens around him, and he tries his best to make a good situation out of it. Sure enough the intelligence and the humor and the raw emotion that comes from Auggie got to me. I seriously wish that kid came to my library so I could talk to him some more. This is a memorable story with a character that will truly make you wonder. Well done!